Fort Nelson e o portao de entrada para as Northern Rockies (montanhas) e se localiza na vasta região dos rios Muskwa-Kechika, também conhecida como a “Serengeti do Norte”. Estabelecida como um entreposto de comercialização de peles em 1805, a cidade de Fort Nelson também floresceu com a construção da rodovia no inicio dos anos 40. Ela e o coração das Northern Rockies e seu estilo de vida e o de uma cidade pequena e rural, com infindável beleza natural ‘a qual a rodovia deu acesso. O nome e derivado do Almirante Nelson e hoje em dia possui uma populacao de aproximadamente 5.000 habitantes. Em Fort Nelson, acampamos no Triple “G” Hideaway Campground e na ocasiao havia uma convenção de trailers chamados “Airstream” os quais viajavam em comboio desde os Estados Unidos, passando pelo Canada e indo ate o Alaska também. Seguindo passamos pela região do Muncho Lake, cuja beleza e indescritível...uma das joias desta região, ele e um lago de degelo , profundo e gelado e sua extensão e de 11km de comprimento e 1.6 km de largura. Nesta area existem muitas pousadas, campings e alojamentos para turistas. Na sequencia passamos pelo Liard River e pelas Liard River Hot Springs – aguas termais, que se localizam junto ao Liard River Hot Springs Provincial Park. Este e um dos poucos parques que permanecem abertos durante todo o ano. Mesmo durante o inverno a agua e quente o suficiente para se ficar imerso nas aguas e este local e tido por muitos como um dos melhores locais da Alaska Highway. Existe uma passarela de madeira que passa por uma vegetação abundante devido ao micro clima gerado pela agua termal, que leva ate o poço de agua termal. After leaving Dawson Creek – “mile 0” – we continued on the Alaska Highway passing through the town of St. John – located in the heart of the Peace River country, it has grown with opportunity since the completion of the Alaska Highway and is now the region’s largest service center. 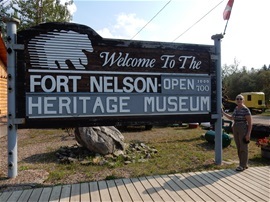 Fort Nelson is the gateway to the Northern Rockies, on the edge of the vast Muskwa-Kechika region, also known as the “Serengeti of the North”, being the largest community and service center. Established as a fur trading post in 1805, Fort Nelson really flourished as a result of the construction of the Alaska Highway in the early 40’s. Today the community enjoys the small town, rural lifestyle and the endless natural beauty the highway now offers access to. Named after Admiral Nelson, it is located at mile 300 on the Alaska Highway and today is a modern and thriving community of approximately 5,000 people. We checked in the Visitor Center which offers plenty of space, use of computers and free wifi, brochures with info on the area and important and historic places, maps of the routes and very useful information on important services offered on the route. Besides having an extremely qualified and knowledgeable staff ready to answer all your enquiries. Across the street from the Visitor Center is located the Fort Nelson Heritage Museum which presents a number of collections from antique cars and trucks to historic buildings, hand tools, and even an old “derrick” once used for drilling…The Museum grounds also feature monuments and memorials to the men and women who built the Alaska Highway. Following the route we crossed the vast area of Muncho Lake which is one of the region’s jewels - it is a deep, cold glacial lake (7 miles long and 1 mile wide)…In this area there are several lodgings, campgrounds, RV parks and provincial parks which allows one to go fishing, hiking, and enjoy the outstanding views of natural beauty found in its surroundings. Next we got to Liard River and the famed Liard River Hot Springs – which are said by many to be one of the best stops on the entire Highway. Located in the Liard River Hot Springs Provincial Park, this is one of the few provincial parks that stays open all year around. Even in winter the waters are hot enough to enjoy a soak in a natural setting. Just a short boardwalk stroll through excellent moose habitat, surrounded by tropical foliage due to the heat of the springs, the Hot Springs is home to several species of orchid, found only in this location.